Do you need help turning your dad bod into a model bod? SculpSure is an ideal non-invasive treatment for men who are already in shape, but need help eliminating stubborn fat around the abdomen and love handles. This 25-minute treatment uses hypothermic laser technology to eliminate up to 24% of treated fat in those areas. There is no downtime and full results appear in 6 to 12 weeks. Most patients see results with as little as one treatment. However, you may wish to have additional treatments based on your desired results. When you come in for your consultation at our New York office, we can discuss the best treatment plan for you. ∗Many patients start to see results as early as 6 weeks following treatment as the body begins to evacuate the eliminated fat cells, with optimal results usually seen at 12 weeks. ∗Treated fat cells are eliminated during the treatment and will not regenerate. ∗Due to the non-invasive nature of this treatment, there is no downtime with SculpSure. You can have the treatment during your lunch hour and return to work immediately. Our NYC patients especially love this because it doesn’t interfere with their daily lives at all. The number of fat cells stored in our body typically remain constant throughout adult life. ∗After the SculpSure body contouring treatment, the eliminated fat cells will never return. However, as we lose weight, the size of the fat cells become smaller, but typically do not decrease in number. Even with diet and exercise, many people have difficulty losing weight in these troubled areas. 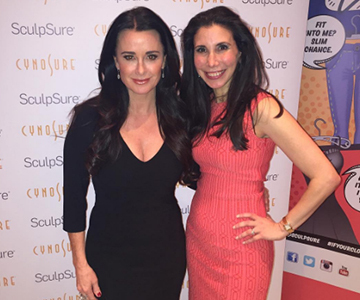 Dr. Levine and Kyle Richards at SculpSure media launch. Lance Bass joined us to lose his love handles.